By taking the season’s fifth win, Porsche has extended its lead in the manufacturers’ standings of the FIA World Endurance Championship. At the sixth out of nine championship rounds, held in Austin, Texas, the reigning world champions, Timo Bernhard (DE), Brendon Hartley (NZ) and Mark Webber (AU) achieved their third victory in a row in tropical weather conditions. They had started from third position on the grid. Meanwhile coming from fifth on the grid, this year’s Le Mans winners, Romain Dumas (FR), Neel Jani (CH) and Marc Lieb (DE), experienced a rather mixed race in the United States. They finished fourth in the six-hour race and defended their lead in the drivers’ championship. When the race got underway at 5pm local time, ambient temperatures were over 35 degree Celsius and tested the drivers and mechanics to the limit. The cooler it became after sunset, the stronger the Porsche 919 Hybrid became. Thanks to a well-managed pit stop strategy, the winning trio took the lead some time after mid distance. In total this is the 12th victory for the innovative Porsche 919 Hybrid prototype since its 2014 debut. 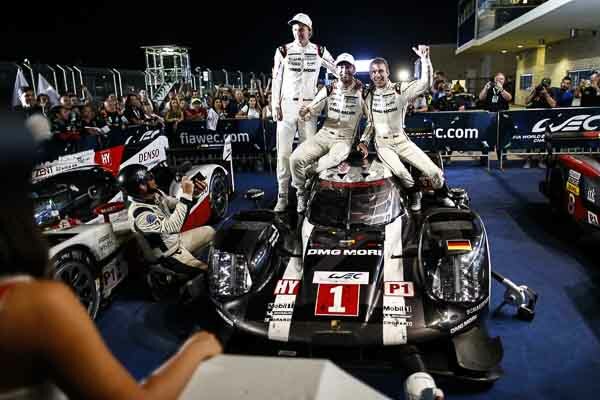 For Bernhard/Hartley/Webber it is their seventh WEC success. Porsche now leads the manufacturers’ standings with 238 points ahead of Audi (185) and Toyota (137). Dumas/Jani/Lieb lead the drivers’ standings by 37.5 points ahead of the best Audi trio. Start driver Webber improves from P3 to P2, but then has to let the two leading Audis go. After 28 laps he hands the car over to Hartley, still in third position. During the stop Hartley drops back to fourth, but soon fights with Anthony Davidson in his Toyota and gets back P3. After 57 laps Bernhard takes over. His stint ends early after 76 laps, when the team uses a “Full Course Yellow” for a pit stop. Webber jumps in again and his stint is also shortened by a Full Course Yellow after lap 94. Hartley continues in P3. A longer pit stop for the number 8 Audi promotes him to P2. After 121 laps the race sees its third Full Course Yellow – just at the perfect time for the number 1 Porsche 919. Bernhard leaves the pits as the new race leader. On lap 133 an accident for the number 7 Audi leads to another Full Course Yellow. Bernhard hands over to Webber, who keeps defending the lead. After 164 laps Bernhard gets behind the wheel again. As happened during all the previous pit stops, the tyres were changed as well. Bernhard brings home another race win. Shortly after the start Dumas manages to get past Mike Conway’s Toyota and improves from fifth to fourth. But on lap four he is overtaken by Sébastien Buemi in the sister Toyota and is back in P5 again. After 27 laps Jani takes over and successfully attacks Davidson on lap 35. After 56 laps it is Lieb’s turn. The championship leaders continue in P4. After 76 laps during a Full Course Yellow Dumas jumps in again. After 93 laps – during the second Full Course Yellow – Jani takes over again. After 112 laps he is due to have an extra stop because of a slow puncture. He stays in the car and continues in P5 before the Audi’s mishap promotes him to fourth. After 134 laps he hands over the 919 to Lieb. After 161 laps and at the next stop there is a driver change to Dumas. With just 12 minutes to go, the Frenchman has to pit for tyres because of another slow puncture before he brings the car home in fourth position.